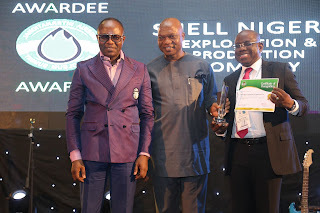 The Subsea Tree Refurbishment feat by Shell Nigeria Exploration and Production Company (SNEPCo) in-country, drew a deafening applause as it earned Shell Companies in Nigeria the Best Performing International Company in Technology and Innovation at the awards night of the maiden edition of the Nigeria International Petroleum Summit in Abuja, reports NaijaAgroNet. The state-organised event was attended by Nigerian and international industry leaders. An excited Okunbor described the award as a recognition of the pioneering role of Shell Companies in Nigeria in local capacity development and Nigeria content. “We are pleased that this feat has continued to receive recognition within and outside Nigeria. Beyond cost consideration, we were also looking to indigenise the know-how so that Nigerian engineers can acquire the necessary skills,” he said. Pix: L-R: Minister of State for Petroleum Resources, Dr. Ibe Kachikwu; Country Chair, Shell Companies in Nigeria and Managing Director of The Shell Petroleum Development Company of Nigeria Limited (SPDC), Mr. Osagie Okunbor; and the Managing Director, Shell Nigeria Exploration and Production Company, Mr. Bayo Ojulari, during the presentation of The Best International Company in Technology and Innovation to Shell at the 2018 Nigeria International Petroleum Summit held in Abuja… on Monday.